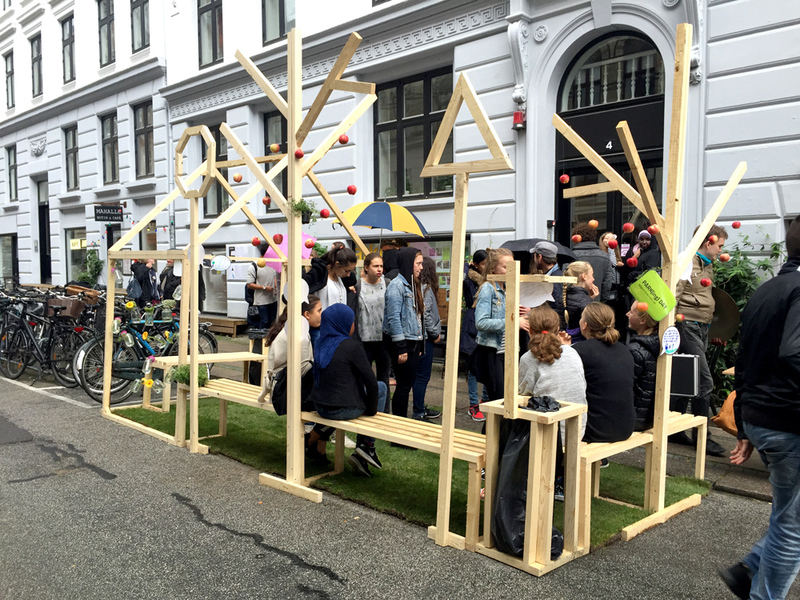 This project gathers the event park(ing) day that we executed both in 2015 and 2016 due to its enormous success. Over the last few years we have been working with tweens at Blågårds Public School in Nørrebro. We engage the students in the development of the local area and the school. When working on-site with 1: 1 prototyping the students are able to achieve ownership of their ideas and their space. They gain the ability to competently and critically participate in society through the experiences of participation and solution-oriented processes. 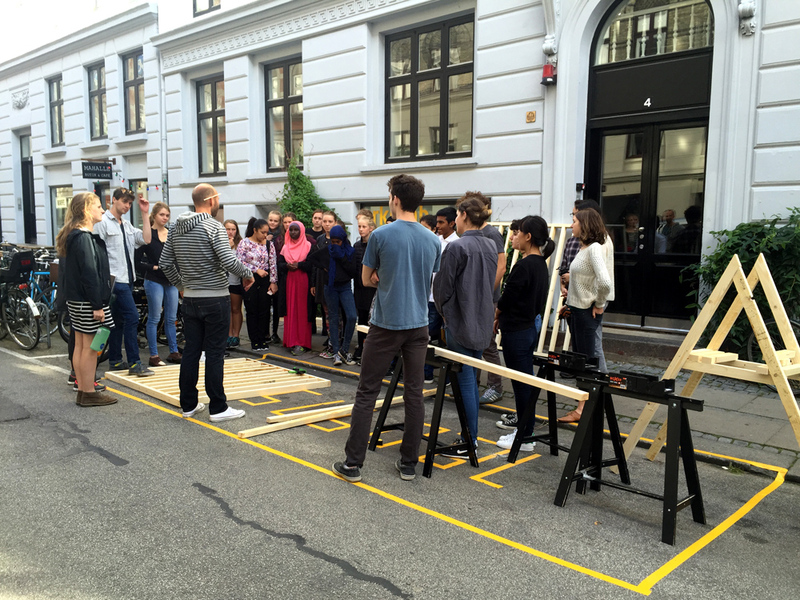 In the fall of 2015 we facilitated an elective course called “Citylab”. We wanted to share a critical attitude to urban design with the students. And what better than to engage them in a real-life project? The global event Park(ing) Day, where parking spaces around the whole world are transformed into liveable green oases, was an obvious choice. The parking lot in front of our office was chosen as the site. The task was for the design of this temporary urban park to offer innovative solutions to the problems the tweens have experienced in public space. 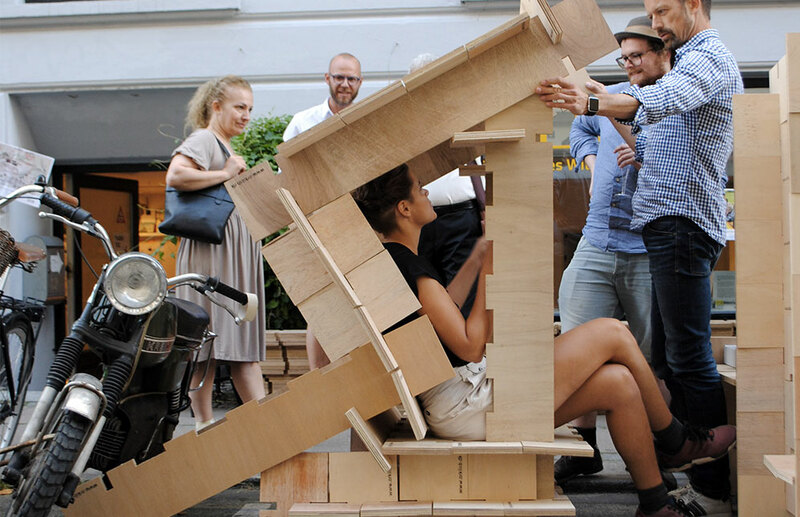 Some wanted a playful trash can to help people clean up after themselves, while others proposed social benches to stimulate more conversations in public space. Once the overall design principles were set, we invited the students to build a prototype of their different ideas. When involving students in the practical building process, we find that new dynamics and synergies always arise. Cool stuff happens! 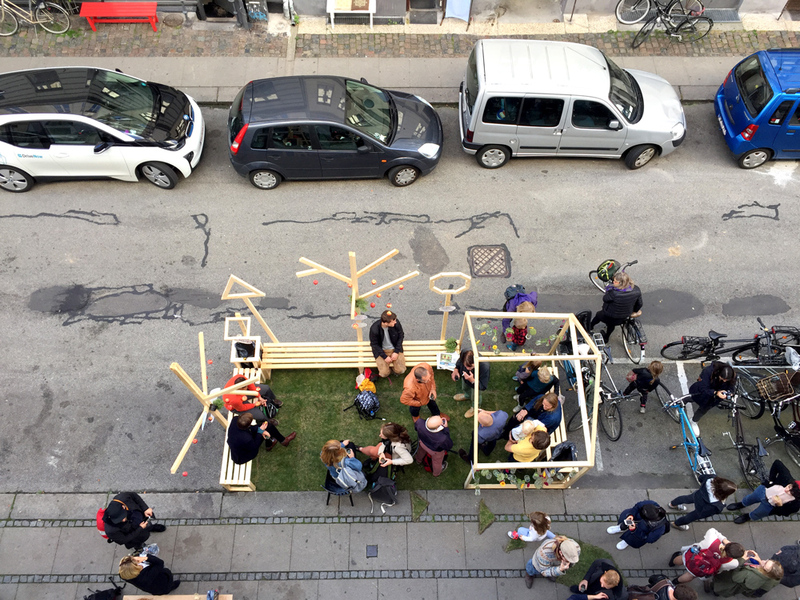 For one day, our parking lot transformed into a lively, green and playful little park full of people, with apples hanging from the trees and living grass on the concrete. The students presented their personalised solutions to problems they face in urban space through physical installations such as benches, trees, experimental trash cans etc. Many people dropped by throughout the day, and one of them was the Technical Mayor, Morten Kabell, from Copenhagen Municipality. The tweens had a fruitful dialogue with this prominent guest. Luckily for us, he was able to give his feedback to their different ideas and it turned out that many of the solutions were in line with the visions that the Municipality is working on at the moment. Kabell underlined many times that the students truly have the possibility to change the city and have their ideas heard. This is exactly our mission when we teach students. We try to engage and inspire them while always showing them how they can change their surroundings by giving them the relevant tools and knowledge. We want them to know that their voice is valuable for society and the development of the city. Also, it’s a way of nurturing committed young people who can be a driving force in citizenship and participation. 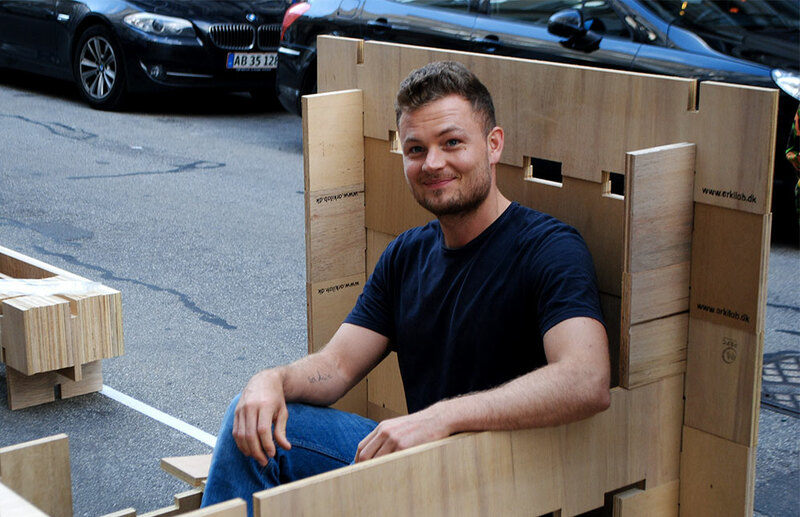 In 2016 we repeated the Park(ing) Day experience. 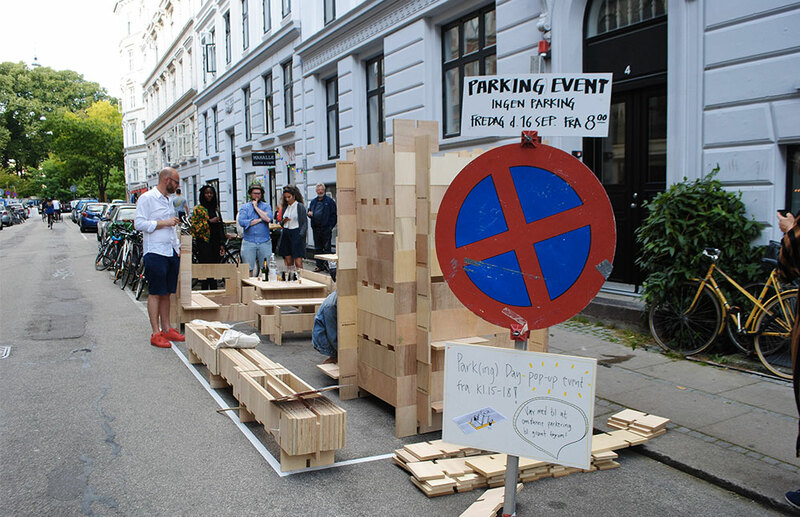 Like former project in 2015, we used a parking spot in front of our office on lovely Birkegade, in the heart of Nørrebro. Everyone was invited to be a designer for the day. 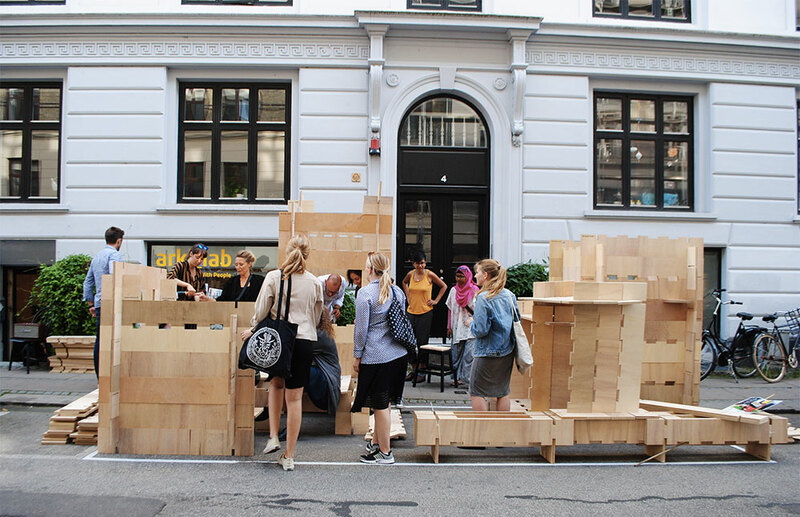 Many locals, passers-by, and architecture students joined us for the event to look for innovative solutions for that little parking spot in front of our office, as well as create a discussion about the future of our cities. 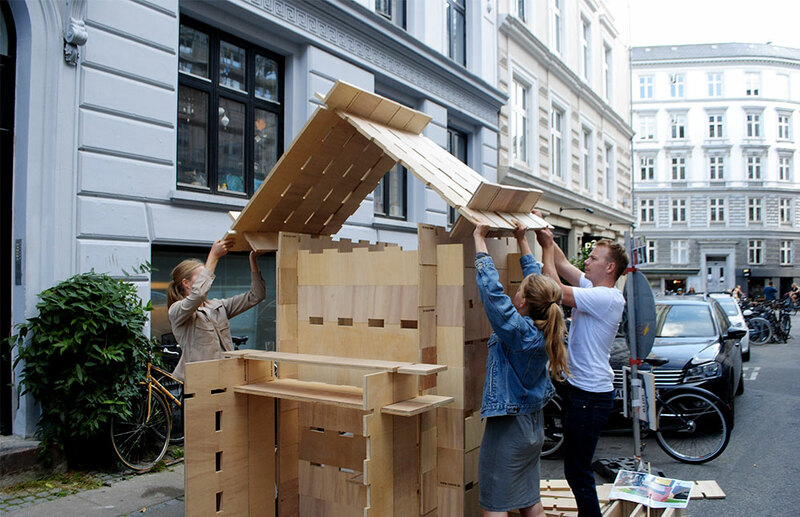 Park(ing) Day was the best occasion to test out our most recent tool: the prefabricated modular wooden boards! 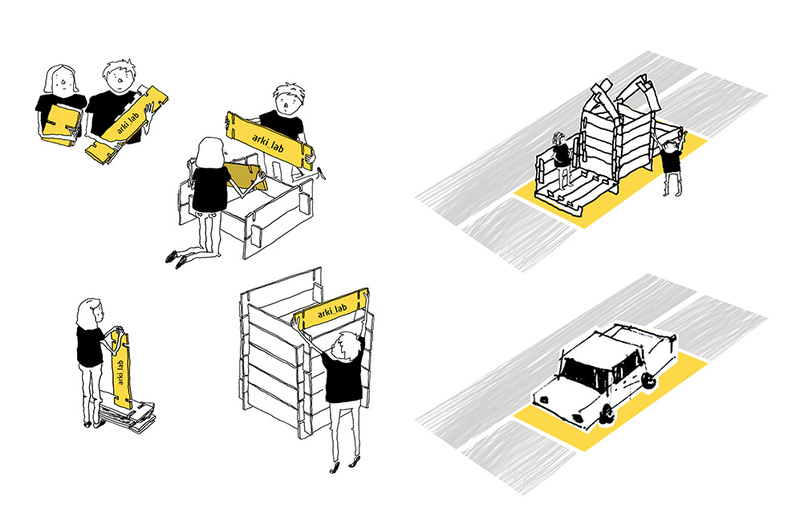 We designed three modules that could be assembled into multiple configurations for various uses. These modules enabled people to imagine whatever they wanted and to build their ideas in 1:1 scale. The process was easy: let your imagination fly, then share your ideas and discuss their advantages and disadvantages. Then finally, roll up your sleeves and build it! Piece of cake. Thanks to our playful and flexible prototyping tool, everyone was encouraged to participate and contribute. The outcome was outstanding: tables, bars, chairs, benches, deck chairs, and climbing walls were gradually erected in a tiny parking spot on Birkegade. Cool stuff happened! The wooden modules were a resounding success. Being very easy to use, everyone was able to build with them. Throughout the day, the parking spot never stopped changing: Think, test, build, reflect, deconstruct and rebuild. 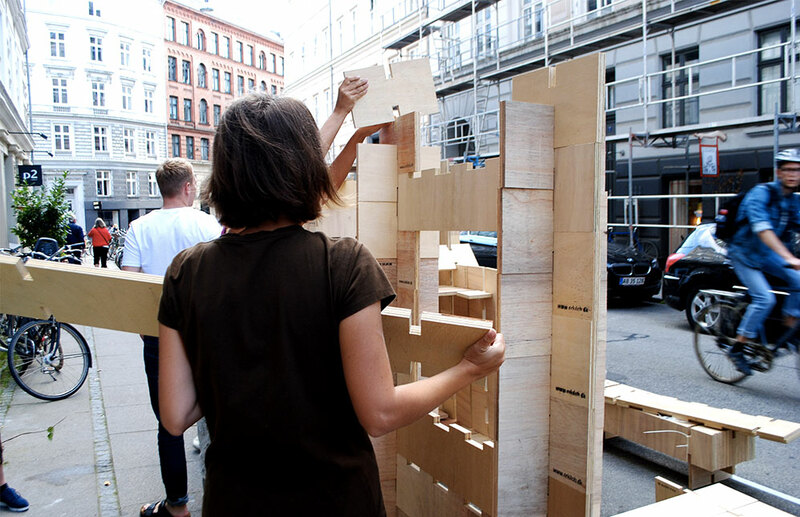 Prototyping is always a good way to test out ideas quickly, and thanks to the wooden modules, it was fun and easy enough for people to engage in the process. 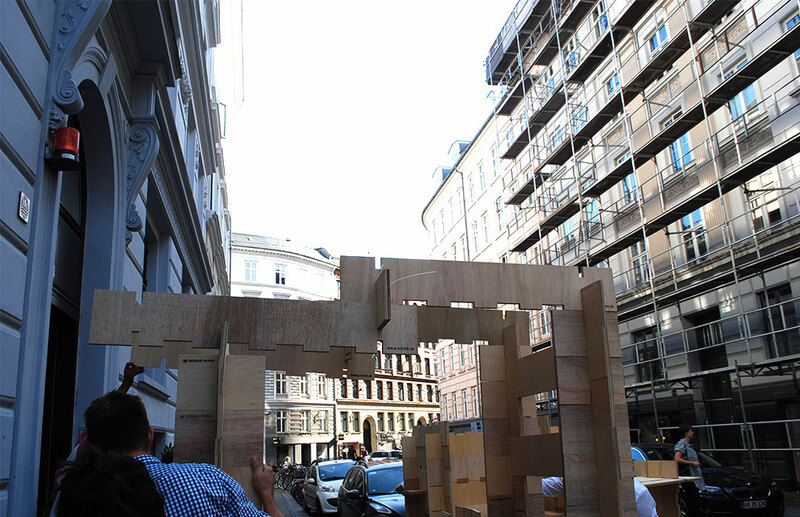 For one day, the front of our office was transformed into a playful park. The day was rich with great talks and meetings, and we are excited to use this tool soon in other projects. Maybe you’ll come across it in one of our future workshops.